Wash the zucchini well to remove any grit and dry them with paper towels. Trim off the ends and quarter the zucchini lengthwise. Slice off the top 1/4 to 1/2 inch of the soft seed core by running a sharp knife down the length of each quarter; it’s all right if some of the seeds remain. Arrange the zucchini, cut side up, on a baking sheet lined with paper towels. Sprinkle with kosher salt (about 1/2 tsp. per 1 lb. of zucchini) and set aside for 10 min. Blot the quarters dry with the paper towels. Heat a gas grill to medium high or prepare a medium-hot charcoal fire. In a small bowl, whisk 2 Tbs. of the oil, the vinegar, thyme, lemon zest, 1/4 tsp. salt, and 1/8 tsp. pepper. Toss the zucchini with the remaining 1 tsp. olive oil. Set the zucchini cut side down on the grill and cook (if using a gas grill, keep the lid closed), flipping occasionally, until it browns and softens but doesn’t turn mushy, 6 to 8 min. Cut the zucchini into 3-inch pieces and put in a medium bowl. Whisk the vinaigrette again and drizzle over the zucchini. Sprinkle on the Parmigiano, toss well, adjust the seasonings to taste, and serve immediately. Love this! It's so simple yet has very good flavor. 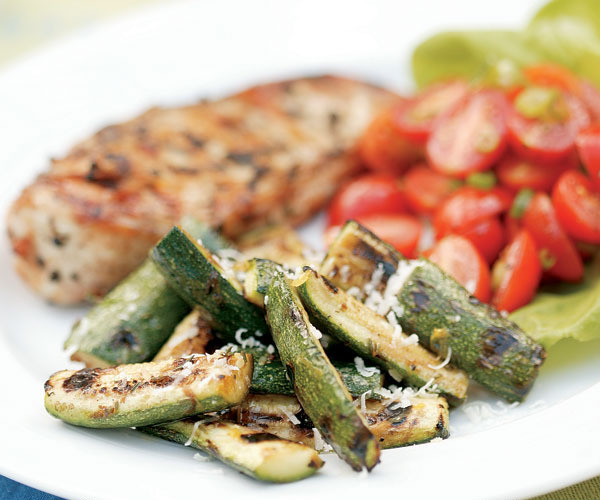 A nice way to use zucchini which often is just blah. Now my favorite way to eat zucchini! This recipe is easy to make, offers a nice flavor kick, and is good for you! 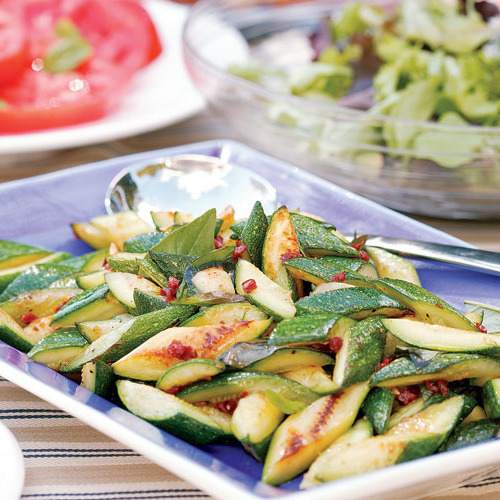 An innovative way to use the ever-present summer zucchini and a perfect side dish for just about any meal made on the grill.